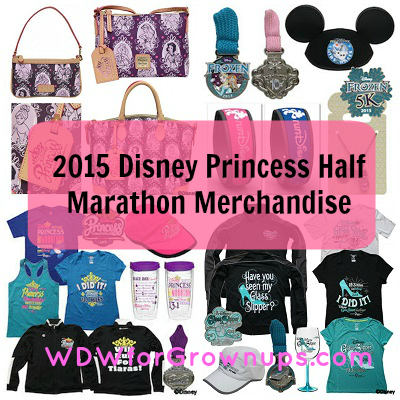 POSTED: Sat, 02/14/2015 - 18:00 | POSTED BY: Traci C.
As with every runDisney race, there is a line of merchandise for the Princess Half Marathon featuring the race logo, including a pink ear hat complete with tiara and attached veil. You'll also find T-shirts, jackets, tank tops, and other headwear including Sweaty Bands. The runDisney Kids Races are represented by an Olaf ear hat. Guests will find a special limited edition runDisney MagicBand for this year's race in pink and blue. Both MagicBands retail for $24.95 and can be linked later. Glass Slipper Challenge participants can check out the line of merchandise specific to the challenge which includes apparel and other items featuring the tag line "Have you seen my glass slipper?". If you visit the D-Tech on Demand boutique located in the Marketplace Co-Op in Downtown Disney you can create and customize a case for your smartphone. Cases are available for the iPhone (4, 5, and 6 series) and several Samsung Galaxy editions. 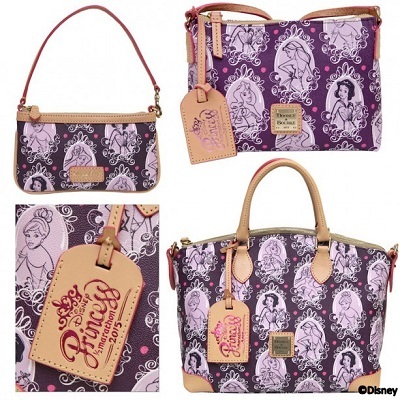 And the very popular Disney Dooney & Bourke handbags return to the Princess Half Marathon again this year. This year's design is purple and features several Disney Princesses in addition to a special race-edition hangtag. The bags normally sell out very quickly so get to the Expo early. The Disney Princess Half Marathon merchandise is available at the runDisney Health and Fitness Expo at the ESPN Wide World of Sports Complex on February 19 from 10 a.m. until 8 p.m.; February 20 from 9 am. until 7 p.m. , and February 21 from 9 a.m. until 5 p.m.
Are you running a race during the 2015 Disney Princess Half Marathon Weekend? Let us know what merchandise you're excited about! Oh I love this year's Dooney!